I’m Italian and I’ve almost ever lived in Italy (if you take off some month in France and some others in England…). And that should be enough to explain you which kind of relationship I can have with bagels: none! I’ve seen them in movies, on tv, but I’ve never ate a REAL one in my life. 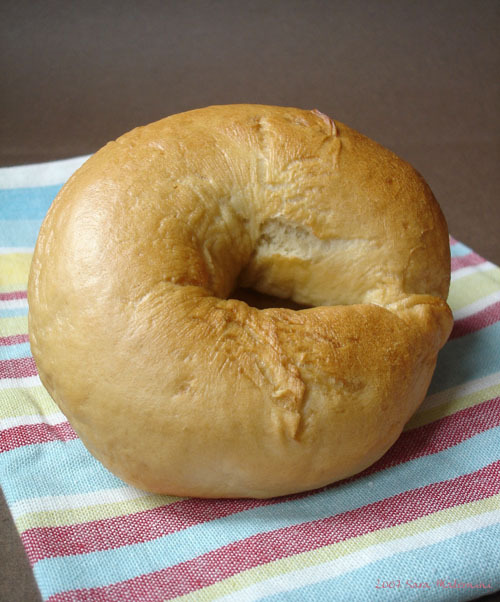 Once I ate a very expensive one from this chain, but I don’t know if they were the real thing… So, now that I gave you the background of what I can know about bagels (rather nothing…), I can explain you why I came up making them! Monday night we went to the movies early, so I decided I had to fill my afternoon making something handy we could eat in the theatre. Searching searching, I thought, well, bagels! I’ve never make them and they always seemed so nice! I took the only possible book I could trust in the matters of baking and I began. In the kneader bowl (or any bowl if you are so crazy to knead this by hand: your choice, not mine!) crumble yeast, add sugar, then water, mix and let rest for 20 minute, until it foams. Add the rest of the ingredients except the black treacle, and begin to knead on medium low speed. After 5 minutes (with the kneader, at least 10-15 by hand) touch the dough and if it’s too wet or vaguely sticky, add flour: drier the better. Knead for 5 minutes more. Oil a glass bowl, form a ball with the dough, then coat it with little oil and let it rest in the bowl, covered with plastic, for 1 hour. the dough will be ready when pressing your thumb the imprint will remain. Punch the dough (thinking of the face of someone you hate: it always works!) then divide it in two, roll each piece in a big sausage, divide each in four. Take each of your piece, make a little ball, then begin to roll it in a long sausage. Form a circle, close it well and leave to rest on a floured surface, covered with a tea towel, for 20-30 minutes. In the meanwhile, preheat the oven at maximum and bring to the boil a large pan full of water ( you won’t need it too deep, just 5 centimetres). When the water is boiling, dissolve the black treacle. When the bagels are puffed, and the water is boiling, add each bagel to the water, two at the time, and cook for 30 seconds each side. Lay them, well distanced, on a oiled baking sheet and cook in the oven for 10-15 minutes, until shiny and golden. Tomorrow, before leaving for my Easter vacation (Strasbourg, Rhone Valley and Camargue), I will tell with what I’ve filled them! neanche io li ho mai assaggiati (nè fatti), come sono? They are a bit like the fatter and softer (much softer)cousins to the Taralli I think! Buone vacanze di Pasqua…in quei bellissimi posti! @Terry: spero che il giorno che a te verrà in mente di farti del baccalà alla vicentina, venga in mente pure a me! So che non è stagione, ma ne avrei una voglia!!! I’ve been meaning to make this recipe forever – now I want to make it even more, Piperita! (la mia ricetta me li faceva bollire per piu’ tempo) – c’e’ anche un dettaglio su cosa dovrebbe succedere durante l’ebollizione, cosi’ puoi sapere se ti sono venuti piu’ o meno come avrebbero dovuto. Qui di solito si mangiano con cream cheese (filadelfia, in italiano), o uova strapazzate. Alcuni meno tradizionalisti hanno cream cheese mescolato a miele o a noci. Teoricamente i bagels sono una ricetta ebraica e dovrebbero essere mangiati salati, pero’..
@checookit: black treacle è la melassa inglese. Se ci clicchi sopra puoi vedere il sito inglese. Bellissima ricetta, peccato che ho difficolta a capire l’inglese, saresti così gentile da tradurla? Buona Pasqua! Io li ho assaggiati a Vienna dove li producono un po’ come i loro pani, pieni di semini, papavero, zucca, girasole, etc. e in alcune catene il filling te lo scegli tu. Divini!